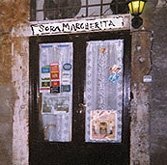 A traditional Jewish trattoria in Rome’s ghetto neighborhood, Sora serves only lunch (dinner on Saturday). Cozy and authentic, the nook is cherished for its hard-to-come-by homemade cooking. Try the house pasta e ceci, baccalá and tortino di alici. More local favorites include pasta e fagioli, the house speciality, tonnarelli cacio e pepe and ossobuco. Also, trippa (tripe) on Wednesday and gnocchi on Thursday — as Rome tradition dictates. Book ahead or come before 9:30 p.m. to beat the crowd. Usually about €30 a head. Closed in August.